Zoom! Wow! It’s Super Mickey, Wonder Minnie, Super-Power Pup, Super Goof, Dynamo Duck and Upsy-Daisy to the rescue! In an exciting adventure straight out of a comic book, Power-Pants Pete swoops down and starts shrinking everything insight down to teeny-tiny size! To save the day, Professor Von Drake transforms the Clubhouse Gang into super heroes with incredible powers. But Pete’s merely a sidekick; a wily villain named Megamort is the true mastermind behind theshrinky-dinky caper. Can our heroes outsmart the bad guys? Only by working together, with help from YOU… and the right Mouseketools! Packed with action, surprises and nearly two hours of fun – including three additional episodes – this Super Adventure celebrates the unstoppable power of teamwork and friendship. There is something about Mickey Mouse and the gang. My kids are six and eight and still love watching Mickey Mouse Clubhouse. They still scream out the answers that come more easily to them when the characters are asking them to participate and Super Adventure was no different. They both loved and enjoyed it as much as they do most of the shows they watch. I still love that I can put this DVD on and know that my kids will be learning something. I also love that there are always catchy songs in every episode that not only get stuck in the kids head, but in mine too. 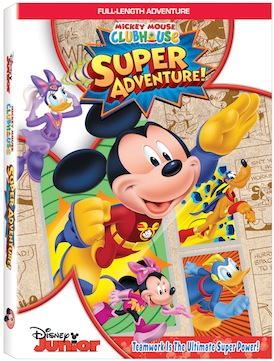 If you have a little one who loves Mickey and the gang, Super Adventure would be a great add to your collection. You can catch this in stores starting tomorrow, Tuesday, December 3rd on DVD! Disclosure: All opinions are my own. I received Super Adventures on DVD at no cost for the purpose of this review. No other compensation was received.